The site of an awful tragedy that struck a longstanding family business is now one of Yangon’s most fascinating sightseeing destinations. 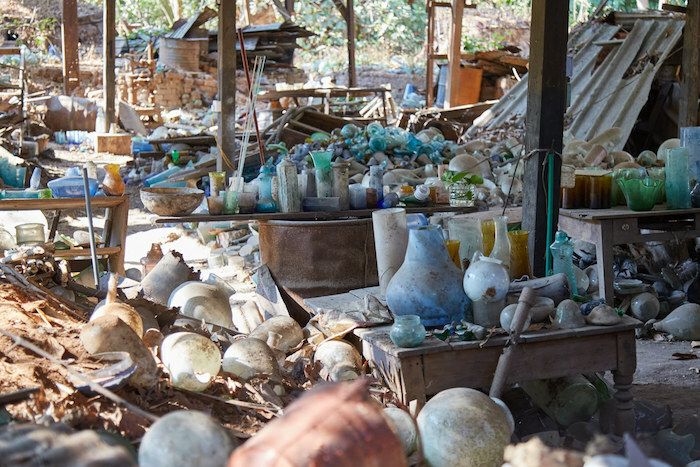 The Nagar Glass Factory was destroyed by Cyclone Nargis in 2008, the country’s worst ever recorded natural disaster. What remains in the jungle ruins around the former factory are countless pieces of colorful glass that were in production at the time. Today, the family that ran the factory for decades still accepts visitors. If you’re looking for a unique souvenir, all of the glass pieces are up for sale. It’s up to each visitor, however, to dig for his or her own treasure among the sprawling glass forest. The Nagar Glass Factory was founded by a man named U Kyin Wan in the 1950’s. Interested in medicinal herbs, he had a hard time finding adequate glass storage containers. Basic glass products were a rarity in Myanmar at the time and a frustrated U Kyin decided to go ahead and make his own. After much time, trial and error, he would finally master the glass-making process. The simple experiment turned into a serious and profitable glass-making business. The factory would go on to produce some of Myanmar’s finest glass, their regular line of products ranging from kerosene lamps to drinking glasses to fancy vases. As their reputation grew, the Nagar Glass Factory would attract a number of famous customers from both Myanmar and around the world. National hero Aung San Suu Kyi is said to have been a regular customer, and the factory even received a visit from US astronaut John Glenn. When walking through this glass jungle, one can’t help but notice all of the colors – blue, green and yellow glassware glistening under Yangon’s hot sun. In fact, it was the factory’s ability to create a rare shade of blue that caught the attention of the Pan Am airline company. Yangon, then known as Rangoon, was a major hub of the now-defunct airline. The company would regularly commission pieces from Nagar to match the trademark blue of their logo. Though there aren’t many left, if you look closely you can spot a couple of these ‘Pan Am Blue’ pieces during your explorations. One of the factory’s most important projects was making the glass eyes for Yangon’s massive reclining Buddha, known as the ‘Chauktatgyi Buddha.’ If you’ve already visited the site, you’ll realize what a major undertaking this must’ve been. Pictures don’t do this gigantic Buddha, or its eyes, proper justice. The site really must be seen in person for one to comprehend its massive scale. Originally commissioned in the early 20th century, the reclining Buddha statue was then recommissioned a number of times until its current incarnation was completed in 1973. By then the factory was being run by U Kyin’s son, Mat Kywe. Most visitors to the factory ruins today will get a chance to meet Mat Kywe. If you’re interested, he’ll gladly share the history of the business and his experiences constructing the Buddha’s eyes, each of which stands at 5ft (.58 meters) tall. Mat Kywe recalls having a series of strange dreams while embarking on the monumental task. If he dreamt of seeing some damage to one of the eyes, he would wake up to discover imperfections he hadn’t noticed before. Eerily, one of his dreams even foreshadowed the death of the monk who commissioned the project. Mat Kywe, now in his 70’s, also happily explains to visitors the process of how the glass was produced and how the factory efficiently made use of its two furnaces. Despite its high output and international success, however, not everything went smoothly for the family-run business over the years. The factory was struck with a number of major setbacks even before the natural disaster that spelled its definitive end. “Myanmar’s military government once asked my father where he found the sand he used to make the glass,” he recalls. But telling them the name of the beach wasn’t good enough. 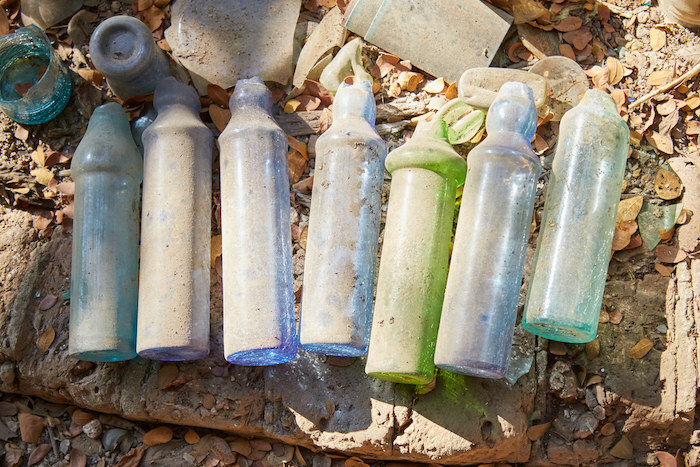 “The government wanted to know the exact spot on that beach, and then went and took it over.” The Nagar Glass Factory was then forced to pay exorbitant fees for access to the same sand they’d been using for years. Later on, gas prices in the country would also soar to unreasonable prices which also had a dramatic impact on the company’s profits. The gas situation was so bad, in fact, that it helped spur what’s now known as Myanmar’s Saffron Revolution back in 2007. Impressively, the Nagar Glass Factory managed to persevere through many serious setbacks for decades. It’s no wonder, however, why the family saw little incentive to rebuild after the devastation caused by Cyclone Nargis. The Nagar Glass Factory of present-day is a bizarre, otherworldly and strangely beautiful site, even if the circumstances that led to its current situation are tragic. And it’s also a great place to visit if you’re interested in picking up some high quality glassware. 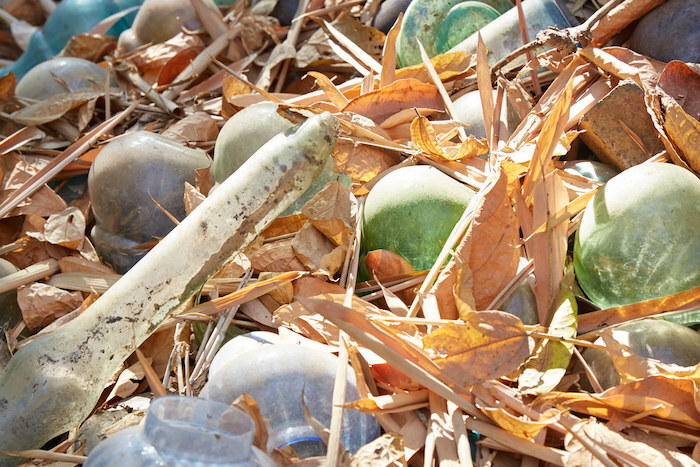 Among the seemingly endless pieces of glass scattered throughout the jungle maze, a large percentage of them somehow remain completely intact. 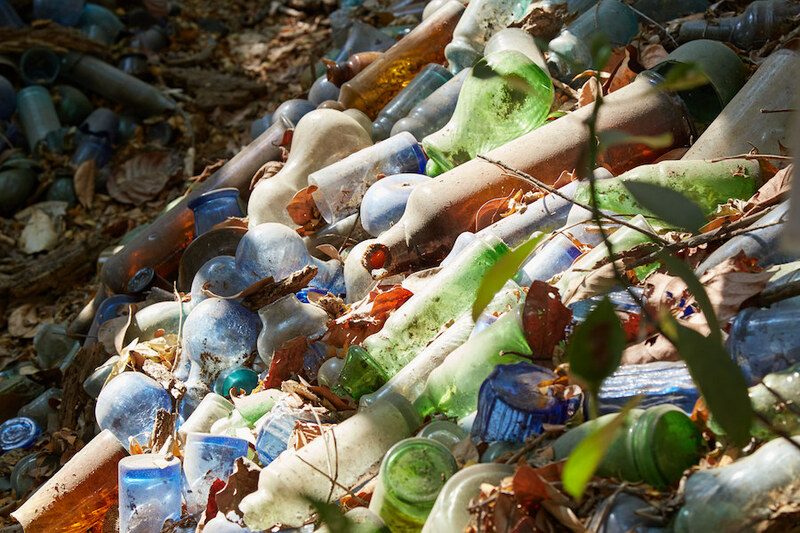 Just when you think you’ve seen it all, you’ll discover another path in the forest lined with even more piles of colorful glass. If you’re looking for a new bowl, glass or vase, then this is the place to come during your time in Myanmar. Take your findings to one of the family members near the entrance and they’ll clean it off and wrap it up for you. Prices range from around 3,000 – 8,000 kyats, depending on the piece and its condition. The Nagar Glass Factory is about a 20 minute walk from either Kamaryut or Thiri Myaing stations on Yangon’s circular train line. It’s not the easiest place to find and there are no signs along the way to point you in the right direction. You’ll also have to walk through some narrow-alleyed residential districts to finally reach it. Be sure to rent a SIM card when you arrive in the country and with help from Google Maps, you should be able to navigate your way. Or, try asking a friendly local to help point you in the right direction. Just keep in mind that even some of the locals still think the place is permanently closed! Near the entrance to the former factory is the common area of the house where May Kywe and his siblings still live. It also serves as the present-day business’s storefront. Hanging on the wall is a large poster that was originally designed to represent the factory. The poster depicts a large hand holding a pile of sand filled with diamonds. “It’s meant to remind people that everything comes from the ground,” Mat Kywe explained. Not only does the sand required to make glass come from the ground, but so does the gas required to power the kilns. When you think about it, pretty much everything we use or consume in our daily lives originally came from the ground in some form or another. The present-day Nagar Glass Factory, then, is a telling reminder that things must eventually return to where they came from. Yangon is not a huge city, but basing yourself near the Nagar Glass Factory would not be strategic if you plan to do some more basic sightseeing. You will likely want to visit Shwedagon Pagoda and check out the city’s old colonial architecture, which is mostly situated downtown. Finding a hotel near the downtown area or close to the Yangon Central Railway Station is recommended. If you decide not take the train to the glass factory, a taxi ride from either area should only take about 20 minutes one-way. Keep in mind that the local government is very strict about vacation apartment letting, so even the listings you find on sites like Airbnb will most likely be officially licensed hotels. As Yangon is often where most people begin their Myanmar trip, you’ll likely arrive by plane. Yangon International Airport has direct flights to and from other Asian cities such as Bangkok, Ho Chi Minh City, Seoul, Tokyo and others. From the airport, the best way to get into town is a taxi which costs around 8,000 kyats. The city is also accessible by train and bus from Mandalay, Bagan and Inle Lake.